Everyone’s Going To Die is a film set in a fictional English seaside town and centres around Melanie( Nora Tschirner), whose life is going nowhere. When a mysterious man, Ray (Rob Knighton), comes into town, she sees an opportunity to save herself. Attempting to leave their pasts behind and move on, the pair endeavours to change their lives for the better. The films tagline is “A man whose life is falling apart meets a girl whose life can’t get started”. Collective Jones directs the film and Nora Tschirner (Sternenfanger, Kebab Connection) stars as Melanie with Rob Knighton (Anti-Social, All Things to All Men) playing Ray. The production shot the film on location in and around Folkestone including various streets, Rotunda and Sunny Sands beaches, St.Mary’s and St Eanswythe Church, St. Peter’s Primary School, Georges House Gallery in the Old High Street, The Quarterhouse, The Leas, as well as various shops and cafes. Additional locations include Folkestone Harbour where the old railway station and harbour arm features as one of the locations where Melanie and Ray meet up. The Grand was the hotel that Ray stays at, Dymchurch Amusements was used for the scenes where Melanie bumps into Ray and the beach at The Warren Country Park was used for some of the beach scenes where Melanie and Ray join Laura (Madeline Duggan) and her friends. Folkestone is a town in the district of Shepway and boasts a beach, harbour, quaint streets, many studios and galleries at the Creative Quarter and The Leas whose mile-long cliff-top promenade of offers sea views to France. Folkestone has been used as a location for filming by productions such as The Tunnel (2013), Is Anybody There? (2009) and Mud Men (2012). 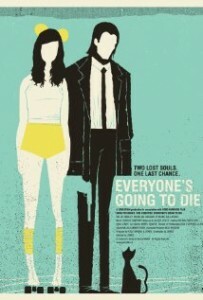 Everyone’s Going To Die was released at film festivals in 2013 and is now available to buy on DVD. This entry was posted in Filmed in Kent and tagged Dymchurch Amusements, Everyone’s Going To Die film locations, feature film, Folkestone, Folkestone Harbour, The Grand, The Leas, The Quarterhouse, The Warren Country Park. Bookmark the permalink.